Atlanta, GA, December 8: The second Annual India vs UK Cricket Cup match between the British American Business Council (BABC) and the Georgia Indo-American Chamber of Commerce (GIACC) was played at Oglethorpe University’s soccer field on Sunday November 12. The two team’s players donning official uniforms (BABC in orange color and GIACC in blue), flanked by two West Indian Umpires Oral Simpson and Conrad Rogers posed for group photographs and introductions by respective captains. Despite very cold and cloudy weather, the match began promptly at 12.30 p.m. when India’s opening pair of Rohan and Rishi walked to the crease. West Indian cricket commentator Enos Phillips (from Guyana) engaged the spectators with his fluent, crisp and oftentimes amusing ball by ball commentary. India team made a slow start but later increased the pace with a flurry of shots by Rohan Dabir who scored 22 runs off 22 balls. But runs came slowly in just ones and twos. Due to drizzle, play stopped after six overs when India were 64/1. The players and spectators used the break to enjoy snacks and hot coffee/tea. Due to weather and time constraints, it was decided to play 14 instead of 20 overs match. Rishi retired after scoring 13, and Gautam stepped in. He hit a few crisp drives but got out for 19. Ketan, Tanmay, Sapan, Ashish and Jinish batted but none could score against England team’s bowlers Farrakh, Tom, Adeel, Andi and Gordon. Three batsmen retired. England threw away 29 runs in extras! GIACC closed its innings at 109/3. BABC opened their batting turn with Jagdish and Andy. The start was even slower than GIACC’s. Ramu got an early wicket of Jagdish. Rohan bowled Andy. Captain Carl got out for a naught. Wickets fell at brief intervals and BABC were 50/4 after 8 overs. But Guy walked in and blasted a flurry of shots all over the field. He hit three huge sixes and four fours! He was severe on Gautam taking 16 runs off his over! There was nail-biting suspense as BABC edged near the century mark. But Guy fell in the final 14th over when he was 54. BABC could score only 96/7. But it was an exciting finish compared to last year’s match. For GIACC, Rohan took two wickets for 13 runs, and Ramu got two wickets, including Guy’s for 21 runs. After the match, all headed for the Hearst Hall for the reception and awards ceremony. GIACC President Mark Pierson warmly welcomed all and said it was a fantastic match to watch, despite the weather. “We got it done! We had a great time and a great reception,” he said. He then thanked and recognized the sponsors. 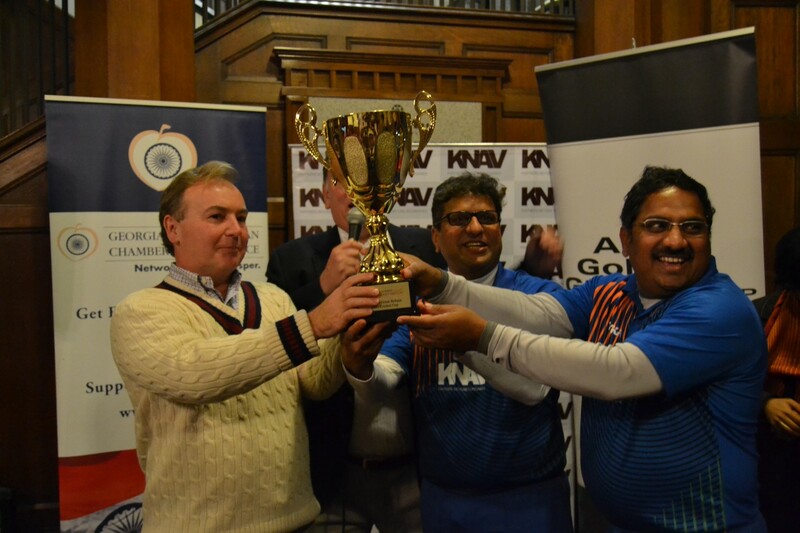 British Consul General Jeremy Pilmore-Bedford presenting the winning trophy to GIACC team members. The title-sponsor Atul Deshmukh of KNAV (Captain of GIACC), an international assurance and accounting practice, thanked British Consul General in Atlanta, Jeremy Pilmore-Bedford for gracing the reception; and BABC for being a great partner. “The Consul General of India could not attend this time due to an unavoidable commitment. 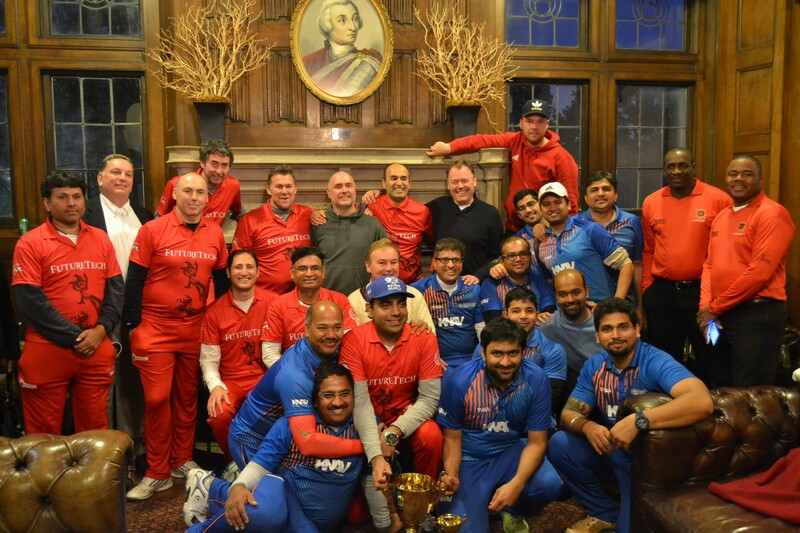 However, it was good to have Bikash Kumar from the Consulate on the team!” Pierson said. He then introduced Anita Ninan, International business attorney with Arnall Golden Gregory, LLP and also a GIACC Board member who had arranged for the special reception with Indian and British food and beverages. Ninan welcomed all and said Arnall Golden Gregory has two offices in Atlanta and Washington, D.C. It is a large and successful law firm with practices in areas of corporate law, immigration, health care, real estate etc. It also partners with BABC in helping UK companies coming into the U.S. and similarly helps Indian companies coming into the U.S.
“I am delighted to be here and sponsor this event. What better community camaraderie than cricket that unites both India and the United Kingdom,” she said. Cotterman presented a plaque to British Consul-General for his help and participation in the match. 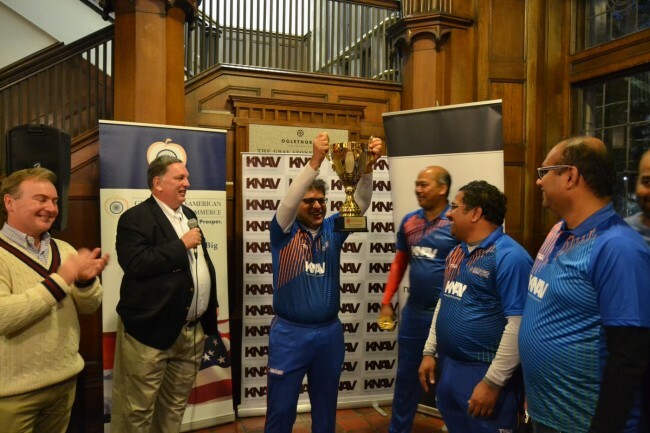 Consul General Pilmore-Bedford said two years ago, he, Mark Pierson and Nagesh Singh came up with the idea of a cricket match between BABC and GIACC. “I enjoyed the match and also to see that the British team is on an upward trajectory. We were only 13 runs away from victory. We will thrash you next year,” he said. BABC Captain Carl said that there is lot of work involved in organizing the match and he commended everyone for their help. Pierson thanked Amber Mehta, Practice Director of International Assurance and Accounting Advisory at KNAV International,and also the Treasurer of GIACC, for the proactive role he played in organizing the event; and also complimented Executive director of BABC, Lindsay for helping with the logo on BABC shirt. Pierson then recognized and thanked the two Umpires Oral Simpson and Conrad Rogers, and Commentator Enos Phillips. Tanmay helped out as a score-keeper. Media was represented by Mahadev Desai and Anjali from TVAsia. Man of the Match: Rohan Dabir who graciously invited Guy to join him on stage while receiving his award. Finally all cheered and clapped enthusiastically as GIACC Captain Atul Deshmukh was presented the Winning Team Trophy.